UPDATE: I've been working hard at this, and I finally have the Best-Ever Gluten-Free Challah Recipe -- it's the only one you'll ever need. NOTE: I've started using a NEW recipe that I'm pretty fond of, although this one still holds a place close to my heart. Check out this other gluten-free challah recipe from MyJewishLearning.com. I've had a lot of requests for my recipe for gluten-free challah, so it's about time I got down to it. Now, I have to start this off by saying that if you are full-blown celiac, there's a chance that you can't handle oats -- even those of the gluten-free variety. I'm blessed in that gluten-free oats and I get along just dandy, so for Passover and on Shabbat and holidays, I partake of the gluten-free oat variety of bread products. If you can't, then my suggestion is to just buy something packaged in the store because gluten-free baking can be expensive. I like being able to make motzei, so for Shabbat I put together this Gluten-Free Honey-Oat Challah. Wait, something else I need to mention: My challah isn't braided. Most gluten-free challah isn't braided. Why? Because the dough just isn't the right consistency for braiding, unfortunately. That being said, does challah have to be braided to be challah? I can't seem to find anything that says that the braiding is a necessity of challah. The reason we have two loaves of challah for Shabbat are clutch in commemorating the double portion of manna that HaShem provided the Israelites in the desert (Exodus 16:4-30). The various shapes and stylings of challot have a varied history. Evidently, according to author Gil Marks, most Ashkenazim used their weekday round or rectangular loaves for Shabbat, but German Jews began to create ova, braided loaves modeled on a "popular Teutonic bread." (Whatever that means.) This shape became the norm, although many Middle Eastern and Sephardic Jews still use a round, flat bread or plain rectangular loaves for their Shabbat challot. 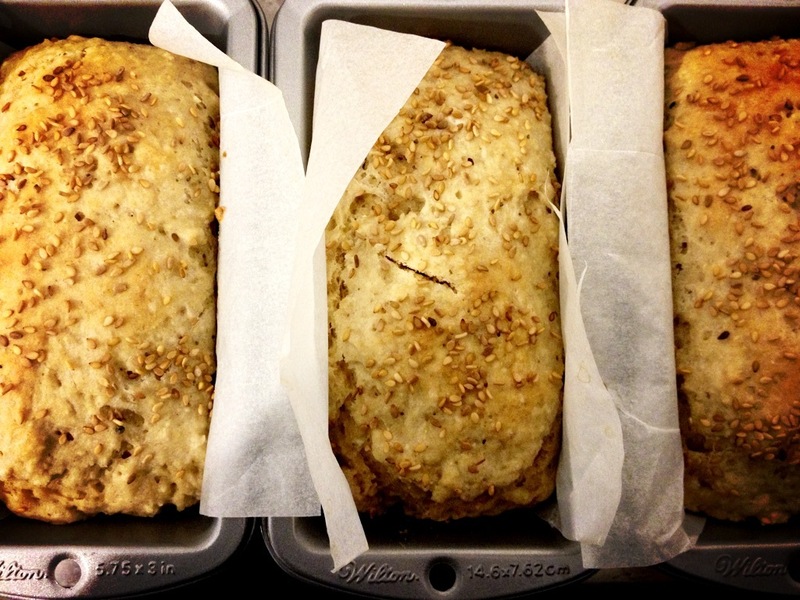 So we'll say that my delicious little Honey-Oat Loaves fall in line with the Sephardic custom, and yours can, too! Just pop over to Barefeet in the Kitchen for the recipe. I'd like to think I came up with it on my own, but credit goes where credit is due. The only thing I did different was bake the loaf in three small loaf pans, but I can tell you this loaf is good enough for even the most discerning gluten-loving foodie (Mr. T was quite fond of it! ).